The Russian State Maritime Rescue Coordination Center reported water pollution in Black Sea on 2 nautical miles south off Gurzuf on Yalta Municipality of the Autonomous Republic of Crimea. The pollution at sea, presumably oil, was spotted close to the shore on several miles off the village area of ​​Nikita. According to the Russian State Maritime Rescue Coordination Center, the pollution is not more than 0.036 tons making oily film above the water level, but do not needs of emergency. At the scene was dispatched boat to start water cleansing options. There is no danger oil spot to reach the shore and to cause any environmental damages. The source of pollution is not yet determined. The investigation is under way and the local authorities are tracking the vessels in vicinity, trying to establish the source. The small quantity of oil might comes from boat, or by discharging of bilge water from cargo ship. 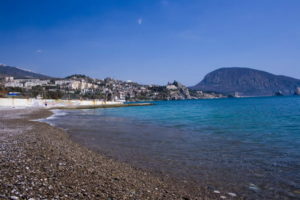 The environmental pollution is close to the heavy maritime traffic route connection Yalta and Novorossiysk, as well as routes to Kerch Strait and Avoz Sea. the site is also close to the city of Yalta, which is important resort city on the south coast of the Crimean Peninsula.